The containers are made up of a number of 'buckets', each of which can contain any number of elements. 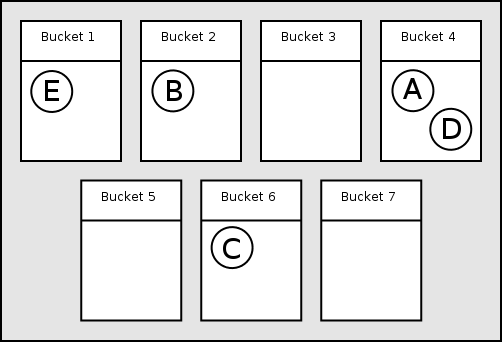 For example, the following diagram shows an unordered_set with 7 buckets containing 5 elements, A, B, C, D and E (this is just for illustration, containers will typically have more buckets). In order to decide which bucket to place an element in, the container applies the hash function, Hash, to the element's key (for unordered_set and unordered_multiset the key is the whole element, but is referred to as the key so that the same terminology can be used for sets and maps). This returns a value of type std::size_t. std::size_t has a much greater range of values then the number of buckets, so that container applies another transformation to that value to choose a bucket to place the element in. Retrieving the elements for a given key is simple. The same process is applied to the key to find the correct bucket. Then the key is compared with the elements in the bucket to find any elements that match (using the equality predicate Pred). If the hash function has worked well the elements will be evenly distributed amongst the buckets so only a small number of elements will need to be examined. There is more information on hash functions and equality predicates in the next section. You can see in the diagram that A & D have been placed in the same bucket. When looking for elements in this bucket up to 2 comparisons are made, making the search slower. This is known as a collision. To keep things fast we try to keep collisions to a minimum. size_type bucket_count() const The number of buckets. size_type max_bucket_count() const An upper bound on the number of buckets. size_type bucket_size(size_type n) const The number of elements in bucket n.
local_iterator begin(size_type n); Return begin and end iterators for bucket n.
As more elements are added to an unordered associative container, the number of elements in the buckets will increase causing performance to degrade. To combat this the containers increase the bucket count as elements are inserted. You can also tell the container to change the bucket count (if required) by calling rehash. The standard leaves a lot of freedom to the implementer to decide how the number of buckets are chosen, but it does make some requirements based on the container's 'load factor', the average number of elements per bucket. Containers also have a 'maximum load factor' which they should try to keep the load factor below. Specify the minimum number of buckets when constructing a container or when calling rehash. Suggest a maximum load factor by calling max_load_factor. max_load_factor doesn't let you set the maximum load factor yourself, it just lets you give a hint. And even then, the draft standard doesn't actually require the container to pay much attention to this value. The only time the load factor is required to be less than the maximum is following a call to rehash. But most implementations will try to keep the number of elements below the max load factor, and set the maximum load factor to be the same as or close to the hint - unless your hint is unreasonably small or large. Construct an empty container with at least n buckets (X is the container type). Construct an empty container with at least n buckets and insert elements from the range [i, j) (X is the container type). It is not specified how member functions other than rehash affect the bucket count, although insert is only allowed to invalidate iterators when the insertion causes the load factor to be greater than or equal to the maximum load factor. For most implementations this means that insert will only change the number of buckets when this happens. While iterators can be invalidated by calls to insert and rehash, pointers and references to the container's elements are never invalidated. Note: rehash's argument is the minimum number of buckets, not the number of elements, which is why the new size is divided by the maximum load factor. The + 1 guarantees there is no invalidation; without it, reallocation could occur if the number of bucket exactly divides the target size, since the container is allowed to rehash when the load factor is equal to the maximum load factor.